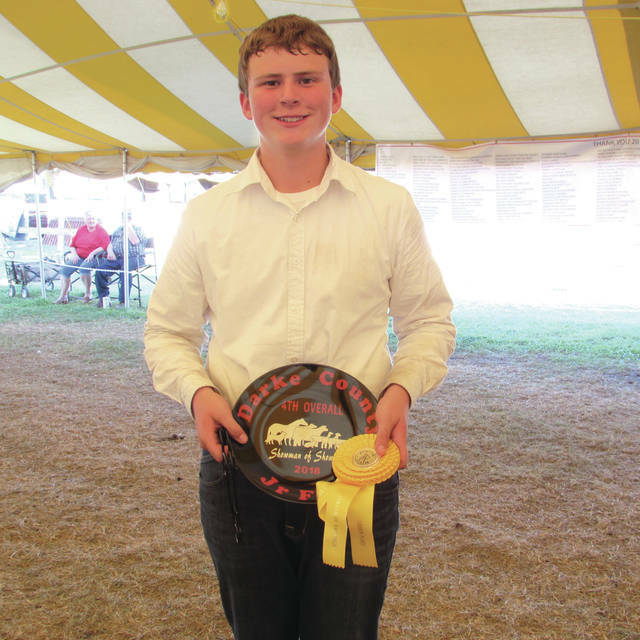 The winner — and five runners-up — of this year’s Darke County Junior Fair Showman of Showmen competition. 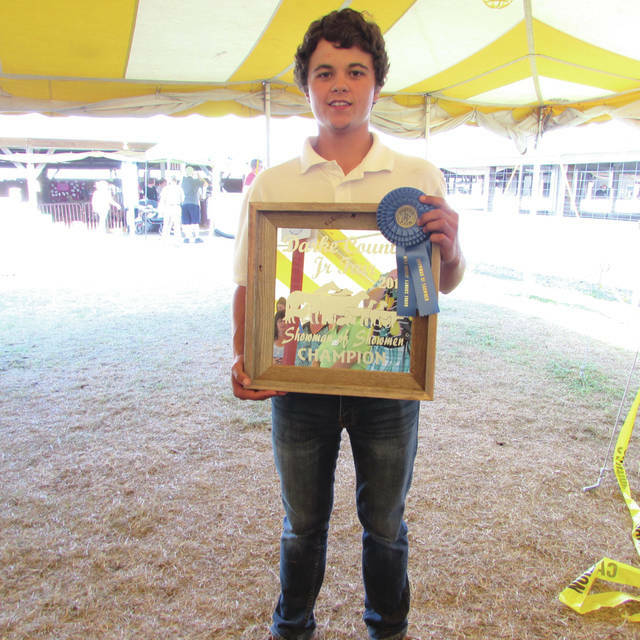 Trenton Prashuhn, representing boer goats, won second place. 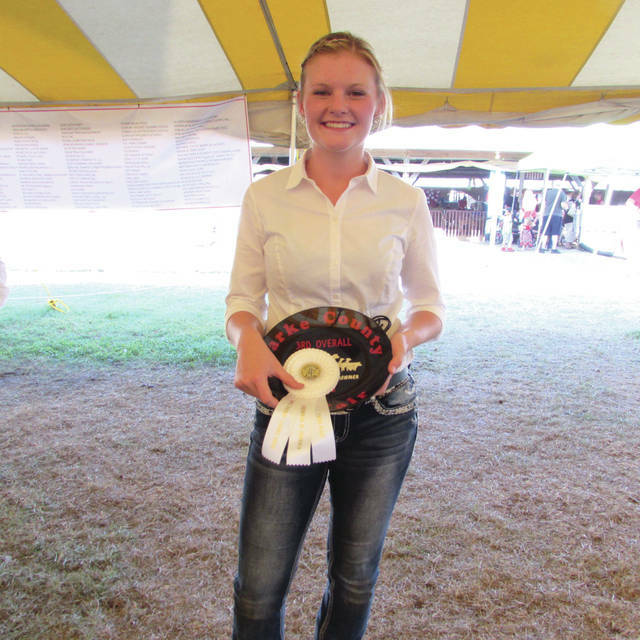 Taryn Dohme, representing the horse department, won third place. Dalton Hesson, representing rabbits, won fourth place. Luke Brinksneader, representing beef cattle, tied with Harley Hanes for fifth place. Harley Hanes, representing sheep, tied with Luke Brinksneader for fifth place. 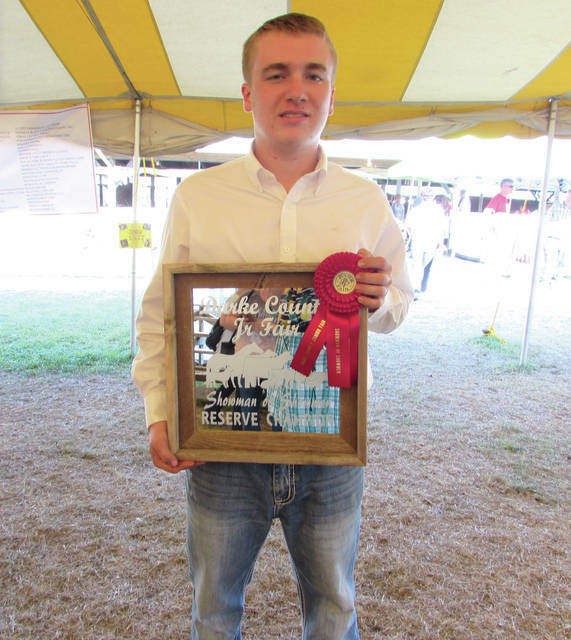 Cole Spitler, representing the Junior Fair Dairy Goats department, won first place at this year’s Showman of Showmen competition. 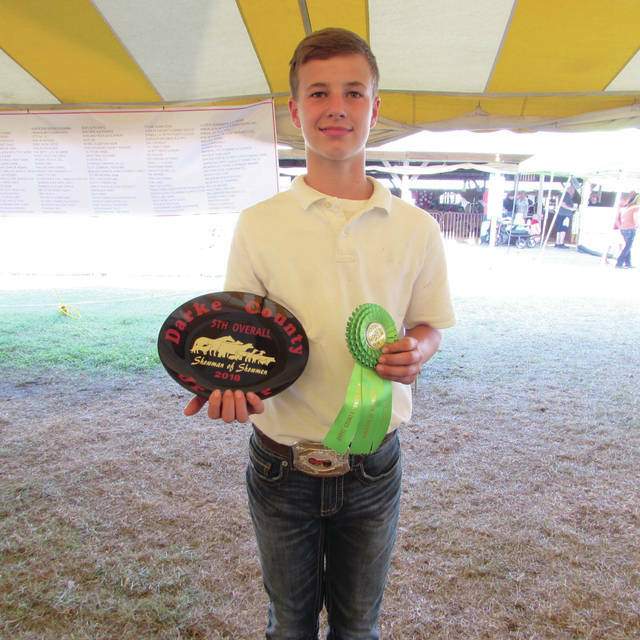 GREENVILLE — Cole Spitler was declared Darke County Junior Fair’s Showman of Showmen Friday evening. and Carrie Rhoades, representing dairy cattle. 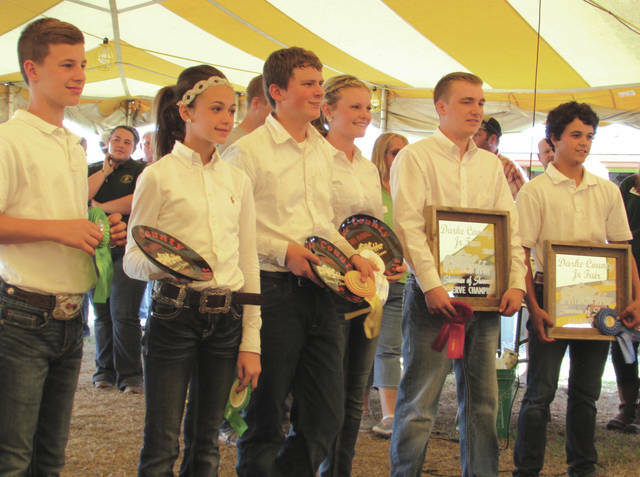 Each of the nine competitors had previously won first-place showmanship trophies in their respective departments. The Showman of Showmen competition began Thursday in the Swine Barn where the exhibitors were randomly matched with animals and judged on their skill at working with the unfamiliar species. 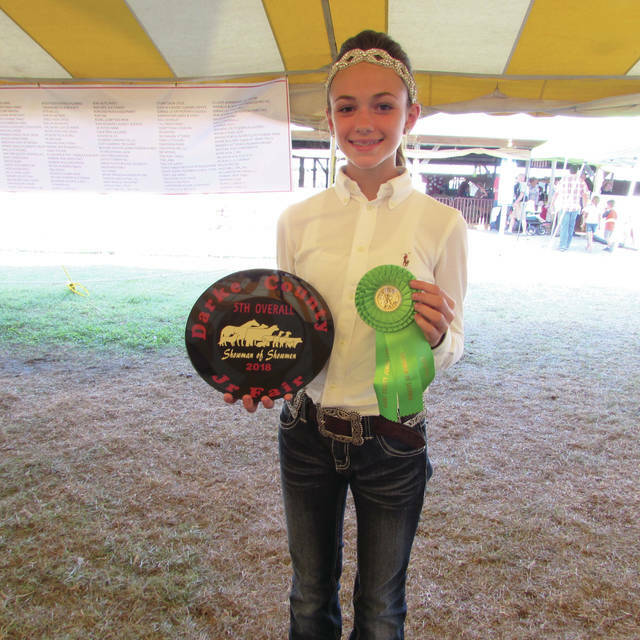 The event resumed Friday at noon with a throng of judges and spectators following the exhibitors from the Horse Arena on the south side of the county fairgrounds to the Cattle Show Arena and others on the northwest side. As in other portions of the event, the exhibitors switched animals partway through the cattle show. Another judge said the most important elements of cattle showmanship are to maintain eye contact with judges, pay attention to the animal in front of you (to avoid collisions) and pay attention to your own animal. The competition then moved to the Poultry Barn where Brittany Harrod of Ansonia, a 4-H veteran with eight years of experience as an exhibitor and two years as an advisor, judged the kids on their handling of the birds, as well as asking each of them a series of questions. The action then moved to the Rabbit Barn and, finally, to a large outdoor tent, where the sheep and goat portions of the competition took place. Winners were announced at approximately 6 p.m. with Spitler coming in first place, Prashuhn winning second, Dohme taking third, Hesson fourth and Hanes and Brinksneader tying for fifth place.